Charles, has been a barista for five years, and although quiet at first, brightens up and can talk for hours about coffee. I’ve always had a passion for coffee. To me it is so much more than just a drink to keep you awake. It’s a beverage that takes an exact science to brew correctly, and a true sense of artistry to deliver the perfect beautiful cup. I went walked into the coffee shop called Kofárna Café and mustered up the courage to ask if I could photograph someone making coffee. The woman behind the registered smirked and turned towards a sheepish man hiding behind the espresso machine. “He’s the one behind it all”, I turned to him smiling “can I snap a few” he smiled a small smile and said sure. That man was Charles the barista. I stepped behind the counter and starting taking photos and before I knew it, Charles and I were chatting away, about different kinds of roasting methods, beans, is question of, Is good decaf possible? the process of pulling the perfect shot of espresso, and of course the artistry and meaning behind latte art. Here is a small photo story detailing the process of making a delicious cup of joe and Charles’s view on coffee culture. A cappuccino with a Swan latte Art design from Kofarna Café in Prague, Czech Republic. Many coffee shops now provide coffee with latte art, but few understand the work and process behind making the perfect cup of coffee. A portrait of a proud artist. Charles’s favourite thing about latte art is it allows him to make more than just a drink, but creates the coffee as a gift, something that is unique and truly special for each customer. 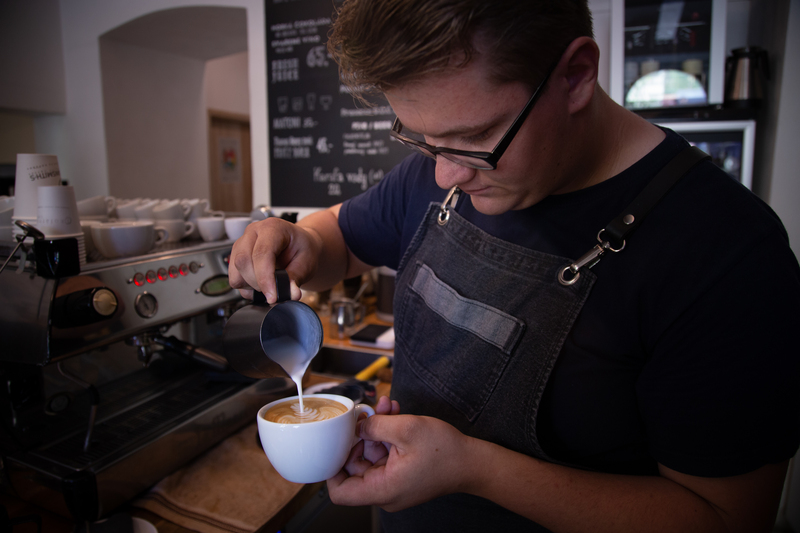 Charles has been pouring latte art for five years and says it takes that long to perfect the art, during his school years, his friends would go to the pub and drink beer, whereas he would go to his espresso machine and practice his craft. He says he’s poured thousands of cups to date. Charles best enjoys creating art in the Cappuccino, the single shot of espresso crema complements the milk. Milk must be frothed using the stream wand. 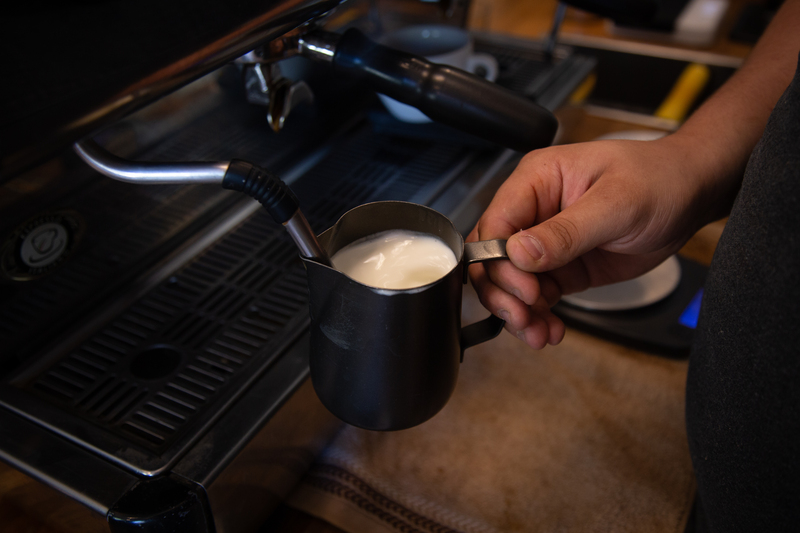 Charles is careful to ensure the milk doesn’t simply bubble, but swirls around the milk pitcher, allowing for the aeration to spread evenly and completely throughout the milk. 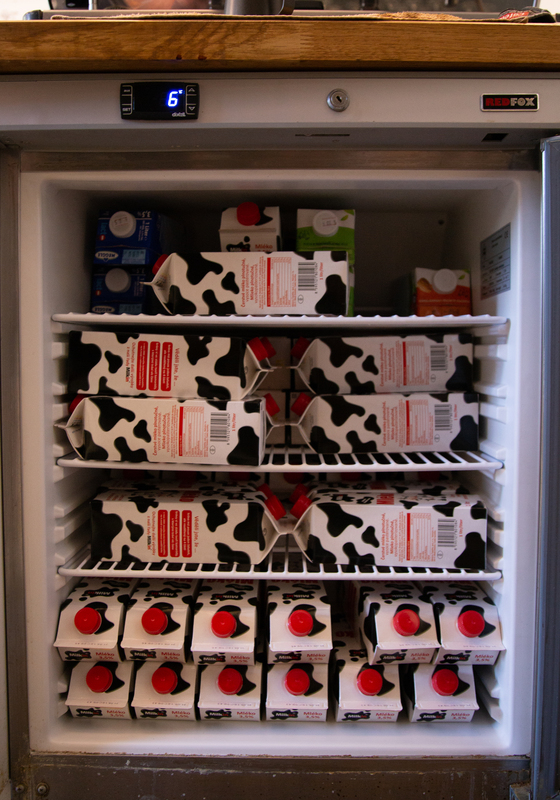 The Kofarna fridge is stocked to the brim with milk. Although completely full, this amount of milk is completely used up in a day and half. Charles keeps a watchful eye on the espresso machine as it pulls espresso at the correct temperature and pressure. Even a few degrees variance in temperature can affect the taste of the coffee. Most espresso is brewed at approximately 93.3 degrees Celsius. Charles then uses a distributer to even spread the coffee grinds throughout the porta filter – ensuring that all parts of the grinds make contact with the pressurized water emitting from the espresso machine. The other tool is a Tamper, used to compress the coffee grinds in the porta filter to remove any air pockets that could disturb the espresso process. An exact science – each Portafilter – is weighted to contain the correct amount of grinds to best pair with each drink. Here, Charles lightens the load as a double shot needs exactly 19 grams of grinds. Kofarna, grinds freshly roasted beans – allowing for the freshest tasting coffee – pulling the most out of the bean by grinding in house. Charles explains that different beans and grinding methods are crucial for nailing the right tasting coffee. 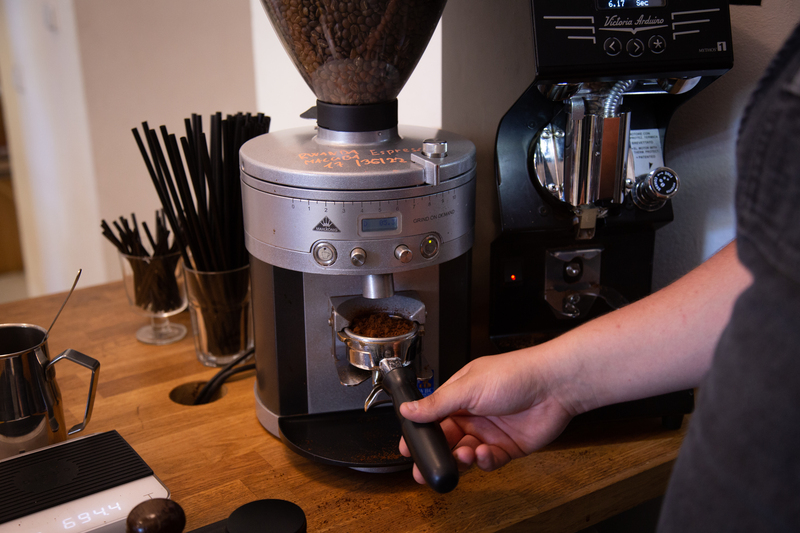 At Kofarna, two conical burr grinders are always at the ready, one with beans from South American regions – good for chocolate- rich tasting coffee, best paired with milk in a cappuccino or latte. And beans from Africa, for a fruiter lighter tasting – best for espresso shots. 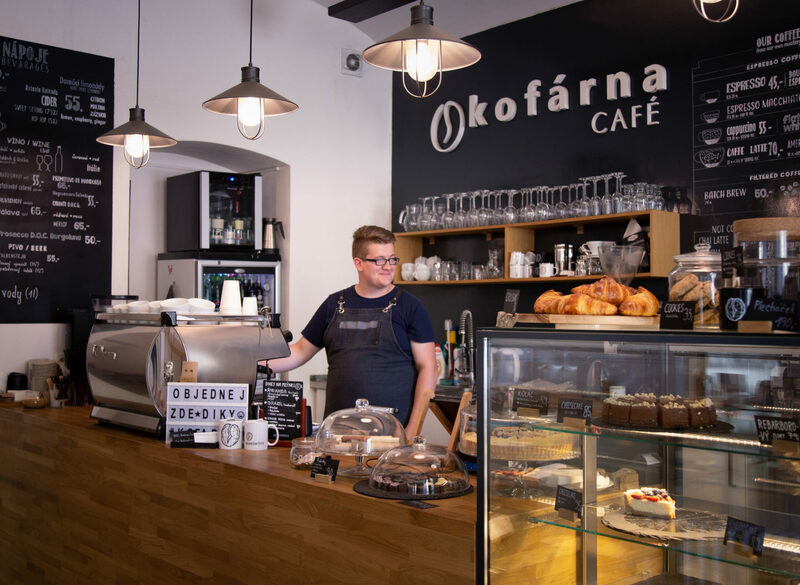 Hiding behind the espresso machine at Kofarna Café is both an exact scientist and artist, behind making a balanced and visually appealing cup of coffee.